You don’t have to lick your finger to know which way the wind is blowing. Look first to the skies, to the slanting rain, to the thrashing trees. Then look at your homeowners insurance policy. Undoubtedly, your premiums are higher than they used to be. Perhaps you’re no longer insured by the company you trusted for decades to help you rebuild if your home was destroyed. In the fine print, you might notice that your hurricane deductible has crept as high as 5 percent of the value of your home – a change that could cost you thousands, perhaps even tens of thousands, of dollars before your insurer pays anything. Tropical Storm Andrea blew through Hampton Roads on Friday – just seven days into the Atlantic’s hurricane season – and though it wasn’t nearly as fierce as tempests that ravaged American shores before it, the damage has been done. In the wake of storms like Sandy, Irene, Katrina and Rita, insurance companies have doubled down on efforts to reduce their risk in coastal areas. Industry experts say it’s grown harder for customers to find coverage because some insurance companies have cut back on where they’ll write policies. They’ve also noticed hikes in premiums and deductibles, while coverage is less comprehensive. We in Hampton Roads already pay a high price for living along the coast. Residents of Virginia Beach and Norfolk, for example, paid about twice as much as their counterparts in Alexandria and Roanoke in 2012, according to a snapshot of five cities’ rates from the State Corporation Commission. 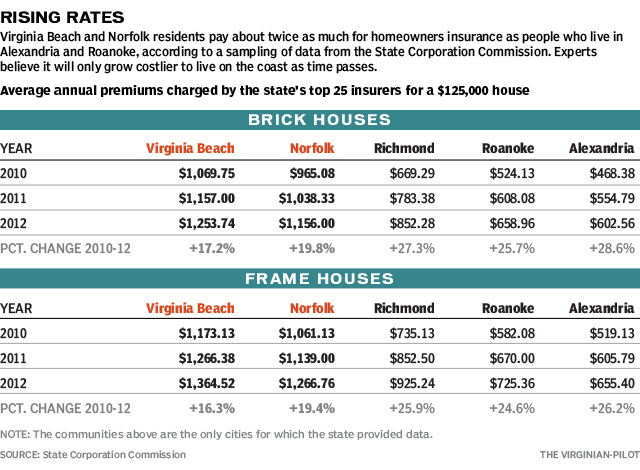 Average premiums charged by the top 25 companies for a $125,000 brick house ranged from $603 in Alexandria to more than $1,250 in Virginia Beach. And those totals don’t include flood insurance – a mortgage requirement for homes in flood-prone areas – which will increase 25 percent in October for some coastal residents. State Farm, USAA and Allstate, the three largest homeowners insurers based on market share in 2012, collectively have filed rate increase notices with the state 42 times since 1995, while they reduced rates eight times, according to state data. The three companies’ homeowners insurance rates were relatively stable or declining roughly from 2003 to 2007, but they’ve risen fairly consistently since then. “The companies say, ‘If you live in a coastal market, it’s not a question of whether you’re going to have a hurricane – it’s when you are going to have it, and we’re not going to be left holding the bag with these huge losses,’ ” said Scott Hunter, founder of Virginia Beach-based Comparity, which help its clients buy coverage by comparing rates from more than 20 insurers. Skip Stiles, executive director of the Norfolk-based organization Wetlands Watch, has used a grant to study the Virginia homeowners insurance industry for the past year. His group worried about the effects of development on shorelines and decided to study insurance because it plays a role in where homeowners choose to build. Stiles said companies such as Allstate, which stopped writing new policies in some parts of the region in 2007, have started to re-enter the market in Hampton Roads, but they’re much more selective about who and what they’ll insure. And they’ve returned with new underwriting practices and legal structures designed to protect them in the event of major catastrophes. The ferociousness of recent storms has driven insurance companies to raise premiums, but the economy played a role too, Stiles said. Insurers lost a great deal of money during the recession, and they felt pressure to raise rates and limit coverage. Many of the major carriers will not write policies along the shoreline anymore, Stiles said, which has opened up the market for companies like Lloyds of London, which charges a higher premium to insure in a risky location. For his study, Stiles interviewed a claims adjuster who said most of his business in the past was generated from State Farm and Nationwide policies. But now, a greater percentage of the claims he works with are from Lloyds of London and American International Group. State Farm uses past storm data and future models to determine a home’s risk of damage. Each address is evaluated individually, said spokeswoman Amy Priddy. The company hasn’t made a “measured decision” to reduce the number of customers it underwrites, Priddy said, and it is still renewing policies for existing customers as long as there is no status change. Customers who move away from the area but hold onto their houses as rentals would be among those in danger of losing coverage. Compared with other types of insurance, homeowners policies aren’t big moneymakers, so insurers have less incentive to stay in the market, said Vicki Whited, personal lines account executive with the Norfolk office of USI Insurance Services LLC. She has been in the business since 1976. When Whited bought her house in 1995, her insurance premium was $477 a year. Now it’s $3,000. But weather patterns are changing and premiums will continue to rise, Whited said. An insurer that backs high-end homes recently told Whited the company wouldn’t write new policies in the area unless its customers paid $25,000 a year in premiums. She has to work harder to find policies for her customers because their options are limited. Mindy Capaldo, personal lines manager for Towne Insurance, said she expects people will still build and buy on the coast, but they have to be educated about what to expect. Larry Atkinson, an Old Dominion University oceanography professor, said sea levels are rising at a faster rate along the mid-Atlantic coast than they are globally. Also, parts of the region are sinking. “By about 2050, it’ll be up a foot and a half from where it is now,” he said. Changes in flood insurance, a federal program that is purchased separately from homeowners policies and often required by mortgage providers in coastal areas, also are adding to the burden of consumers. Like private insurers, the government is trying to bulk up the fund it uses to pay claims related to flood damage. Congress passed a law that will essentially remove subsidies that have long protected homeowners and business owners. In October, the government will begin eliminating subsidies for homeowners who have faced severe repetitive loss. Discounts will disappear for flood insurance policies that have lapsed and for all new policies purchased. Subsidies on flood insurance for vacation homes began decreasing in January. Some homeowners who have been paying discounted rates will suddenly see their premiums spike by 25 percent a year until they reach what’s considered a fair rate based on the amount of risk they face. Hunter, of Comparity, said one of his clients pays $2,000 annually but will eventually pay $5,000 a year for flood insurance. He expects the steep increases to affect the real estate market. At some point, the cost of insurance might be a barrier to residents who want to own property near the water, said Sihler, the Darden professor. “Maybe that’s the way it should be because it is dangerous and it is expensive,” he said. ← Claims can be denied if you fail to disclose issues.